Welcome to the March 2019 newsletter of Let’s Move in Libraries. This edition highlights: a) new resources from the U.S. CDC and NNLM, b) Jenn Carson named a LJ 2019 Mover and Shaker for advocating for moving in libraries, and c) updates on ongoing Let’s Move in Libraries projects. Follow (and share with) Let’s Move in Libraries on Facebook, Instagram, Twitter, and YouTube to stay up-to-date with what public libraries do to get their communities moving. 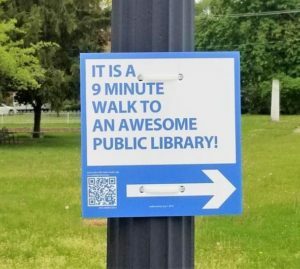 This month’s featured image comes Ohio’s Galion Public Library, which participates in Walk [Your City], a national campaign to promote walkable neighborhoods by creating and posting signs like this one. Read more about what this library is doing to promote healthy physical activity! In response, the U.S. Centers for Disease Control and Prevention (CDC) developed the new MyMobility Plan to encourage older adults to prepare for potential mobility changes in much the same way they may plan financially for retirement. MyMobility Plan provides resources and tips for older adults to help manage their health to maintain mobility, make their homes safer to prevent falls, and consider alternative transportation as they age so they can stay safe, mobile, and independent longer. Take a look and think about sharing this new resource at your library or incorporating it into a public program. In addition to MyMobility Plan, the CDC also recently unveiled a new Physical Activity campaign: “Connecting Routes + Destinations.” It’s all about ensuring that people can safely walk and roll in their communities. The visual guide released as part of the campaign highlights the importance of safe routes to libraries. Let’s Move in Libraries recommends using this new resource for discussions and programs focused on how you can make your library more accessible to individuals accessing it by walking, bicycling, or public transit. The ultimate goal of this campaign is to get people moving! Let’s walk and bike to libraries! The campaign is part of the CDC’s larger Active People, Healthy Nation campaign. How does your library support walking or bicycling to the library? Let us know! Jenn Carson named Library Journal Mover & Shaker! The big news this month is that Let’s Move in Libraries advisory board member Jenn Carson was named a 2019 Mover & Shaker by Library Journal for her advocating for promoting and fostering physical literacy in libraries. This award is so well deserved. Jenn has been working and advocating for this topic for over a decade!! Movement-based programming is more than yoga—story time walks, gardening, and circulating fitness equipment are a few alternatives. Read the full article here. Way to go, Jenn, and we can’t wait to see what you’ll develop next! During the last month, Let’s Move in Libraries project director Noah Lenstra participated in two health conferences: 1) the Active Living Conference in Charleston, South Carolina, and 2) the Sharing Knowledge to Build a Culture of Health Conference sponsored by the Robert Wood Johnson Foundation in Houston, Texas. Look for more information on what he learned in a March 2019 blog post for the American Library Association’s Programming Librarian. Both conferences were amazing, and featured many individuals and institutions interested in working with libraries to promote active, healthy living. For instance, at the Active Living Conference, Dr. Morgan Clennin shared that one of the partners is the Denver Community Active Living Coalition is the Denver Public Library. As part of its work in the coalition, the library launched a Fix-A-Flat program, which is available at seven branches of the library. In addition to bike repair kits that you can check out, the library staff learned how to repair bikes so that they can offer ongoing programs and assistance. Check out this map of participating libraries. In other project news, the “Survey of Library Exercise Programs for Older Adults” is now closed. This survey is part of a collaboration between Let’s Move in Libraries and the National Institute on Aging’s Go4Life. During the next month we will be analyzing the data and we will share preliminary findings in the April 2019 newsletter. Thanks to everyone who filled out the survey! Your input will help shape future directions in this Go4Life in Libraries partnership. We are also thrilled to share that the Geri-Fit in Libraries Study is proceeding wonderfully. According to Fran Fisher, Geri-Fit Director and Study Coordinator, approximately 850 older adults have participated in this study, which is taking place this Spring in 52 public libraries across the country. We’re so excited to see the results of this initiative! As soon as we have additional information to share, we will. Share how you move at your library! Thanks to all of you who email us (or tag us on social media) with stories of how you move in your libraries. In Massachusetts, the Shrewsbury Public Library incorporates movement into its Memory Cafe programs for “people with forgetfulness, Alzheimer’s or other forms of dementia and their caregivers: One of the activities that was very popular was lead by Amy Podolsky, a national Ageless Grace® Brain Health Trainer and Educator. Set to great music, Ageless Grace® Brain Health is like a party in a chair!” Read more about how movement and memory cafes come together at this library. The Mitchellville Public Library in Iowa created an “exercise room” at the library by putting a recumbent bike and an elliptical into their meeting room. Check it out! In North Carolina, the Cumberland County Public Library in Fayetteville partnered with the Arts Council to delight families with stories from around the world at their 10th annual Storytelling Festival. This year the theme was “Storytelling through Movement! The event featured 40 movement-themed programs that illustrated how movement and storytelling come together! Also in North Carolina, Farmville’s Parks & Recreation and Public Library departments are teaming up for the “Farmville Moves” program as a way to promote health and wellness in a supportive group setting. This nine-week series, held Mondays and Wednesdays at 5:30 pm (March 11 to May 8), serves not only as a lead up to the Town of Farmville’s 5th annual 5k & Fun Run on May 11, but also encourages individuals to begin or continue their walking, jogging or running journey. In Bucyrus, Ohio, the local paper ran a wonderful story highlighting the Music, Movement, & More! program that librarian Barbara Scott developed with the support of her local United Way. Read this story to get the inspiration and information you need to do this program at your library! In Pennsylvania, the Bellwood-Antis Public Library is thrilled to announce that as a result of a successful demonstration during their annual Family Health & Safety Fair in February 2019, this summer the library will be teaming up with Blair Senior Services to present free Tai Chi classes for senior citizens. A Tai Chi demonstration presented during the hair was a hit with visitors, and almost everyone who participated in the demonstration signed up for the classes set to start in mid-June. This is the first time one of the demonstrations at the fair has resulted in a long-term class at the library, so their very excited for the opportunity!